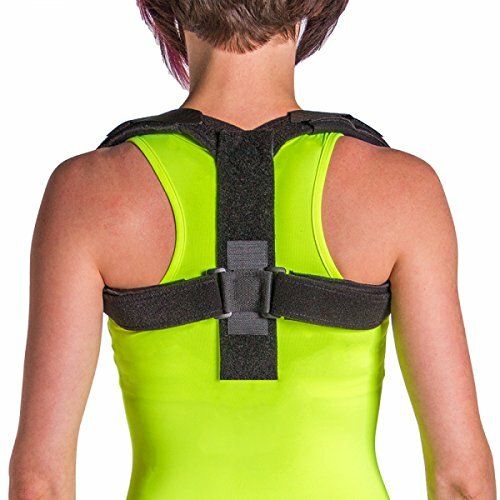 BraceAbility has streamlined what you are looking for in a posture brace by creating the Posture Corrector Upper Back & Shoulder Support. This posture correcting brace is completely customizable, allowing you to find the perfect fit for your body. Once you've found your correct fit, feel free to cut off the extra material because it will not fray. "Alligator" hook pieces are removable, so you can trim the ends of the straps and re-attach them no matter what the length. Initially, we recommend easing into the duration of time you wear the brace. Start out in thirty minute increments and gradually increase up to three hours, depending on your comfort preference. To wash the brace unstrap the Velcro pieces, then hand wash the straps in warm water with mild soap. The brace should be air-dried, do not use high temperatures to wash. The brace is made of latex free nylon and polyester material. SIZING: Size SMALL is recommended for chest circumferences of 30" - 40". Fits most women and smaller-framed males. If too big, this posture corrector can be trimmed and customized to provide the perfect fit for your body. TIRED OF SLOUCHING? This innovative new posture brace can be worn at work or at home to fix posture problems and help you stand up straighter. Start by wearing for 30 minutes per day while sitting or standing, then gradually increase the wear time as your shoulder, spine and back muscles adjust to the new posture. CUSTOMIZABLE: Adjustable design to correctly fit your back and shoulder area (can be trimmed after the right fit is found without any fraying). Padding around your armpit provides the right amount of support without chafing. MATERIAL: This posture correcting brace is made of latex free nylon and polyester material making it lightweight and comfortable. EASY APPLICATION: Backpack like design makes it easy to put on - and you can easily adjust the tension of the straps by yourself without taking off the brace, to control the degree to which your shoulders are pulled back.